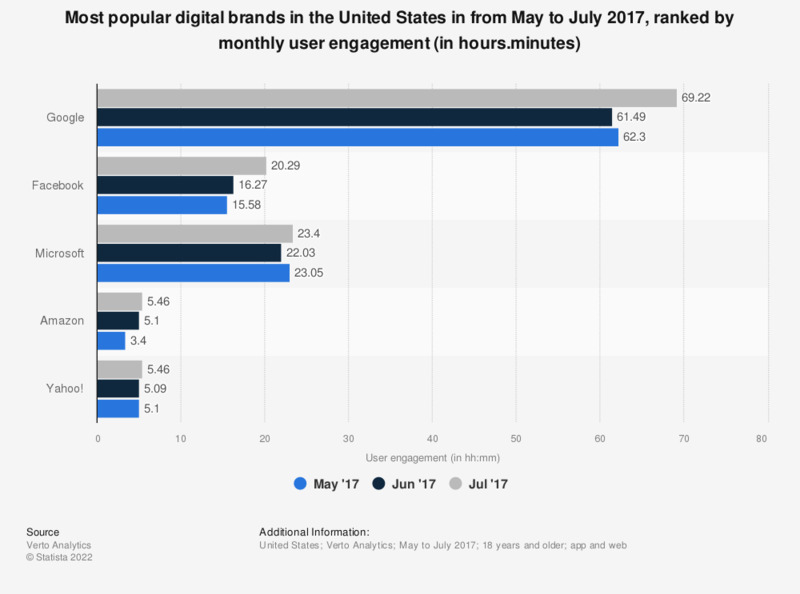 The statistic presents the most visited digital brands in the United States in between May and July 2017, sorted by user engagement. During the least measured month, visitors spent an average of 20 hours and 29 minutes on Facebook. Google was ranked first with a monthly user engagement of 2 days, 21 hours, 21 minutes and 38 seconds. Original data format [dd.hh.mm.ss], figures have been converted and rounded to [hh.mm] for an easier understanding of the statistic. Furthermore, for technical reasons, 23.4 has to be read as 23 hours, 40 minutes and not 23 hours and 4 minutes (which would be displayed as 23.04).